The Russian Museum of Ethnography is a museum that houses a collection of more than 500000 items, that are related to ethnography and the material culture of the peoples of the former Russian Empire and the Soviet Union. The collection of the museum has been completed for more than a hundred years. The collection includes monuments of traditional life, ritual and festive culture of the peoples of Russia, Belarus, Ukraine, Moldova, Ashkenazi Jews, the peoples of the North-West and the Baltic, the Caucasus and the Crimea, Central Asia, Siberia and the Far East, Central and Southern Europe, as well as the Ainu , Japanese, Chinese, Koreans, Mongols, Finns and Saami of Scandinavia. In addition to the collections, the museum also owns funds of books, illustrations, manuscripts and photographs. The museum was organized in 1902. At the beginning, it was the ethnographic department of the Russian Museum.The first exhibits of the museum were the gifts, that were received by the Russian Tsars from peoples of Russian Empire. A lot of objects were supplemented to the museum by the geographic expeditions. Also, many exhibits were purchased by the Russian emperor Nicholas II and other members of his family. The collection was officially opened to the general public in 1923. The museum was separated from the Russian Museum in 1934. 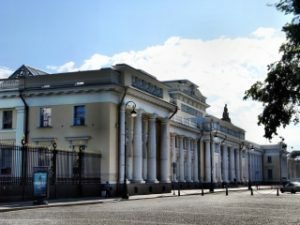 The Russian Museum of Ethnography should not be confused with the much older Museum of Anthropology and Ethnography, that is known as the Kunstkamera. This excursion is not available on Mondays and last Fridays of each month.